Not that we all share the same faith. 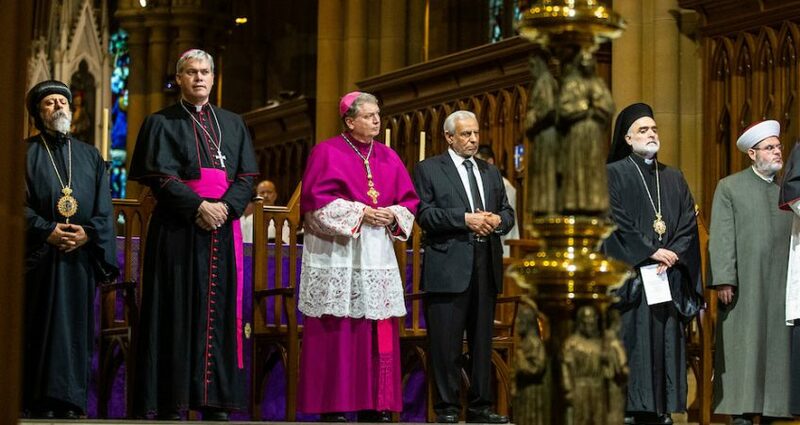 But here we are, in a Christian holy place on the Christian holy day, standing together in solidarity over events in two Muslim holy places on the Muslim day of prayer. We stand together today in our grief over the deaths of at least 50 innocent brothers and sisters in Christchurch, over injury suffered by dozens more, and over damage done to our shared sense of security and peace. We stand together today in our horror at the real evil we have witnessed, at the violence perpetrated and the hate that inspired it. We stand together today in our disgust at the racism of this enemy of mankind and the blasphemy of this enemy of God, and at all who willingly desecrate places of peace, times of ritual, and the bodies of the young and old at prayer. To our shame it seems the perpetrator of this evil was a young Australian. He boasted on social media of being “the strongest man, pound for pound, in town”. He devoted himself to “playing video games, snorting coke and hiring strippers”. He called himself “a goddamn monster of willpower”. A young man, more and more alienated, resentful, radicalized, brutal. To all young people like him we say today: if it is real strength you want, you will find it in compassion and mercy, not hate and violence. If it is real devotion you seek, dedicate yourself to God and goodness and your fellow man and woman, rather than ego and ideology. If you want to be worthy of admiration, cultivate a generous inclusivity rather than divisive arrogance, be willing to serve rather than seeking to dominate. But today is about more than fellow-feeling. Where there is grief, we will bring consolation; where there is horror, we will sow trust; where there is despair, we will offer hope. Lent is for Christians a season of fasting and prayer and looking forward to better. Today I commit myself and my community to fasting and praying with you and for you. Such acts say more than handshakes and rhetoric. For to stand in solidarity is to stand on something solid. That something solid is insistence on our common humanity; it is awareness of our common vulnerability as individuals but our strength when we stand together; it is commitment to common love of God and God’s law of peace; and it is fulfilment of our common morality as citizens in a free land. As-salaam ‘alaykum. Greg Sheridan, “Now we are all Muslims,’ Australian 16 March 2019.